Firstly, consuming millets means you are probably eating organic, without the fashionable price tag. Most millets are not popular as commercial crops (like rice or wheat are) and are grown by poor farmers. They are very hardy and need little water and are naturally pest resistant. Due to this resilience, these “forgotten miracle grains”, are usually organic, in the sense of little or no pesticide or weedicide use; and they are also affordably priced. Secondly, a fun secret we discovered while trying to eat healthy and shed the post baby weight. A lot of the traditional “infant food” recipes in South India are Ragi or millet based. They are also usually the best way to keep mummy lean! Win-win we felt because children learn everything, including eating healthy only by example. Back to our breakfast porridges dilemma. With the crowding out of grocery store shelves with ever increasing convenient and sugary options for breakfast, we felt like Goldilocks has been eating away at our porridge. While we are left eating a more “standardized” and often very sugary meal. We decided to look into the rainbow of traditional breakfast porridges and what we found is going to keep us busy for a while! Malted ragi or malted finger millet porridge is sprouted ragi flour, dry roasted and powdered. Mix the powder in cold milk to ensure no lumps and then cook for a few minutes with cocoa powder and add honey, jaggery or palm sugar to taste. Which child is going to refuse a chocolate porridge for breakfast? Better still, this one has the vitamin C and iron to knock out a prizefighter! Kambu koozhu is a porridge made of pearl millet or bajra, as it is known in Rajasthan and Maharashtra. Like most porridges, the process involves soaking in water, grinding, cooking for a few minutes and then seasoning to taste. Kanjhi is a rice porridge made in homes in Kerala and Tamil Nadu. Conjee, as it is known elsewhere, is also a staple meal in China and many other East Asian and South-east Asian cultures. The yummy kind involves cooking rice with jaggery/gud and coconut. It is often given to young children or older and infirm people, as it is easy to digest. Dalia is the Hindi term for broken cereals. The most common dalia is wheat-based. Cook it in water, add milk and cook for a few more minutes. Then add honey, banana and nuts. High on protein – makes this a great breakfast for both adults and children. Drumstick leaf kanzi is now showing up on lists of super foods as drumstick leaves or moringa. They are being dubbed as nature’s multivitamin fix (with significant amounts of vitamin C and A, calcium and potassium). It is typically made by pressure cooking it with rice, green gram dal in equal part to the leaves, and then seasoned with spices to taste. 1. 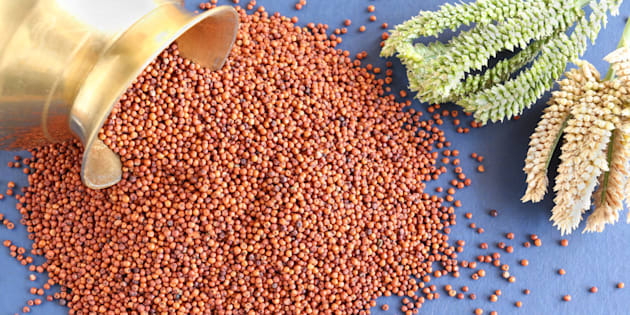 Soak the ragi grains for at least 8 hours. 2. Drain the water from the ragi grains and tie in a muslin cloth. 3. Sprout the grains overnight. 4. If possible dry in the sun for a few hours or at least on a dry towel. 6. Dry roast the ragi (the smell will fill your home with warmth and happiness, we promise!). 7. Once cool, store in an airtight container. To prepare: Take 2 spoonfuls of ragi powder and mix in cold water. Heat for 2 mins in a pan along with grated jaggery and it’s ready to eat. 1. You can add banana cut or puréed.